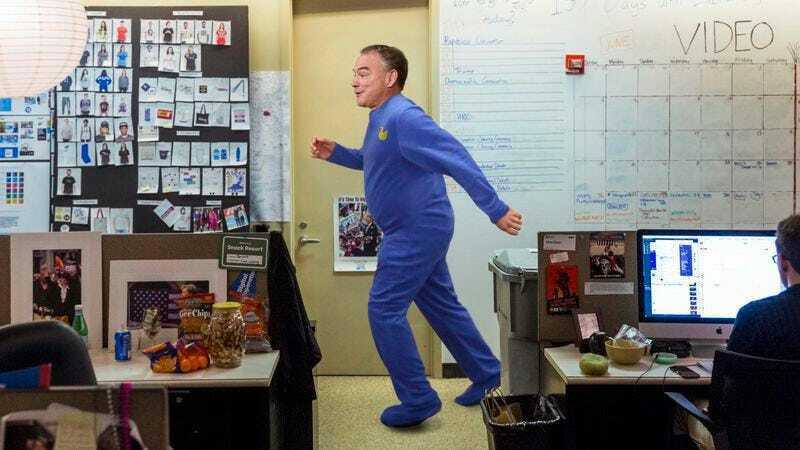 NEW YORK—Evading staff members and giggling uncontrollably while darting between cubicles, a wound-up Democratic vice presidential nominee Tim Kaine was reportedly running around Clinton campaign headquarters Wednesday night in his favorite pair of footie pajamas. “When Tim gets all crazy like this, you just have to let him wear himself out; he was riding around on the campaign bus all day, so he’s got a lot of excess energy to burn,” said campaign manager Robby Mook while the Virginia senator jumped up and down on a nearby couch chanting “Hill-a-ry, Hill-a-ry” and asking volunteers if they wanted to hear him count to 10 in Spanish. “He’s just a little overstimulated with all the excitement of the campaign, and it’s possible that someone didn’t see the sign on the fridge and let him have some grape juice after 7 p.m., but I’m sure he’ll zonk out soon.” At press time, sources confirmed that an aide was gingerly carrying a sleeping Kaine to bed.